The National Museum of Western Art in Ueno, Tokyo, usually closes at 5:30 p.m. But on Nov. 15, a string of people filed through the entrance at 6 p.m. to attend a special viewing session of the “Hokusai and Japonisme” exhibition, which runs until Jan. 28. 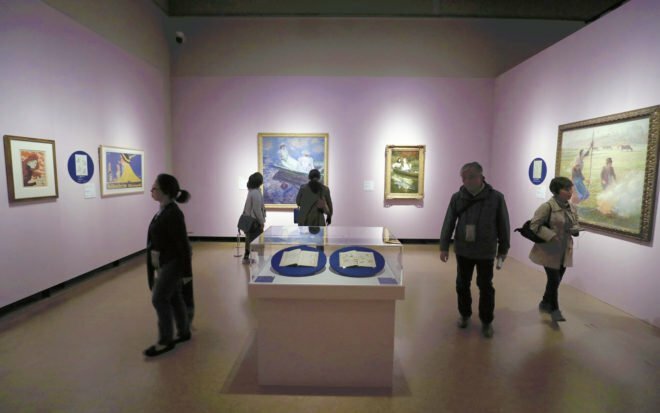 This event was designed to let visitors better admire the artworks on display, with a similar one also held on Oct. 25. Both sessions were limited to 300 people each who could view the exhibition until 9 p.m. Tickets cost ¥3,800, significantly more than the regular ¥1,600 admission fee, and came with an audio guide and a smaller version of the show’s catalogue. Both events were sold out. In recent years, art exhibitions that get large crowds have begun holding similar events for limited numbers of visitors. For example, the Tokyo National Museum’s “Unkei: The Great Master of Buddhist Sculpture,” which finished last month, was so popular that visitors sometimes had to wait up to 70 minutes to enter the facility. Speaking loudly at an exhibition is often considered a disturbance and can bring warnings from the staff in accordance with the museum’s rules. However, some visitors say they’d like to freely discuss their thoughts with friends or take their children along without fear of bothering others. To that end, the Mitsubishi Ichigokan Museum, Tokyo, which is currently holding the exhibition “Prints in Paris 1900: From Elite to the Street,” has been offering special events on a trial basis in which visitors can speak as loudly as they like. The museum in Tokyo’s Marunouchi district holds these special events on days when it’s usually closed. The first such event on Oct. 30 attracted about half of the number of visitors on a regular day. Some attendees were grateful for the chance to go along. “I thought I wouldn’t ever be able to see these artworks if I missed this opportunity,” said a woman with a baby.Yukiko Goto, a public relations official at the museum, said: “We should respond to the needs and trends of the times. We want to hold these events more frequently.” The museum plans to hold another such event on Dec. 25, before the show closes on Jan. 8. In April, the Mori Art Museum in Tokyo’s Roppongi district invited about 20 people who have many followers on Instagram to a special event held after the museum closed for the day. They were allowed to freely photograph the exhibits in a plan designed to utilize word-of-mouth to attract more visitors. In the nearly empty venue, the participants sat or lay down to take photos perfect for posting on the image-sharing service.Photos were also allowed during the regular viewing times for the exhibition. “The event went well, as the number of Instagram posts about the exhibition has risen 1.5-fold since then,” said Nahomi Taki, a PR official at the museum.